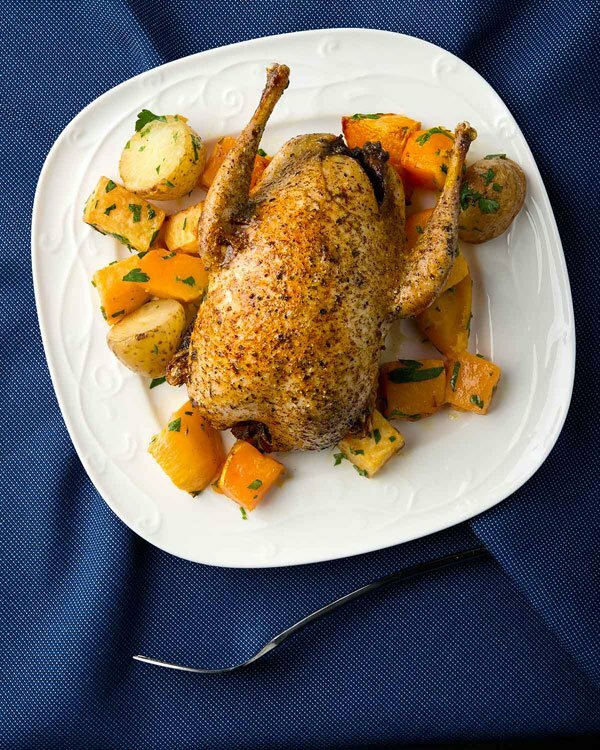 The best way to roast partridge, or grouse, or quail or even pheasants and small ducks, is, well, to not roast them at all. I know it sounds odd, but the most perfectly cooked small game birds come out of a sauté pan, not an oven. 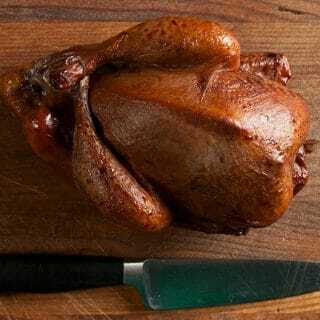 We can all envision the Platonic Ideal of a roasted game bird: Crispy skin, juicy, gently cooked breast meat, and fully cooked, tender legs and wings. The bird will be little salty and bathed in butter or olive oil or whatever oil or fat makes you swoon. Most of all, it will taste of itself. On this I think most of us can agree. Cooking game birds is really an exercise in taming chaos. 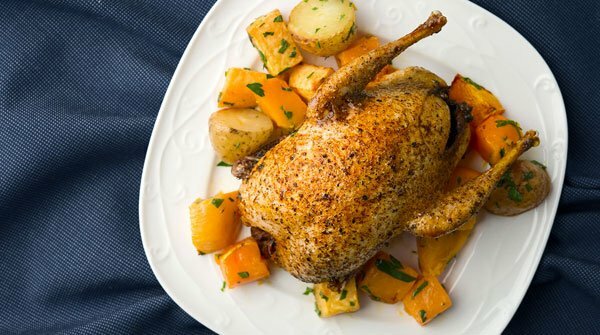 In mathematics, chaos theory states that “small differences in initial conditions yield widely diverging outcomes… rendering long-term prediction impossible.” This is true of cooking in general, but especially so with finicky birds like partridges, grouse, quail, woodcock and pheasant. Consider these questions and think about that quote above. How large is your bird? What temperature is it when you start cooking? How hot is your oven or pan? Is there air circulation? Is the bird trussed or not? How old is your bird? Is crispy skin more important to you than perfectly cooked breast meat? How many birds are you cooking? All small differences in initial conditions that can yield widely diverging outcomes. That said, game birds are all alike in several important ways. First, the breast meat must be cooked more gently than the meat on the legs and wings. Second, a bird’s physical architecture makes it difficult to achieve this. Third, if crispy skin is what we all want, how do we get there without annihilating the breast meat? In an oven, the answer is high heat. And the smaller the bird, the hotter the oven. Roasting a snipe should be hotter and faster than roasting a wild turkey. It has to do with the surface-to-mass ratio of the bird — small birds heat up faster. But even a roaring, 500°F oven won’t really cut it for dainty upland birds like partridges, grouse, woodcock or quail. And snipe? Unless you have a wood-fired oven that can hit 600°F or 700°F, you won’t get close to realizing that Platonic Ideal of a perfectly roasted snipe. Yes, I have oven-based recipes for all of these birds. And I have no intention of removing them from this site, because they work pretty well and are not at all labor intensive. But even with these recipes, which will get you close to the ideal, there’s one major problem: Crisping the breast skin at the end. For me, juicy breast meat trumps crisp skin. One way to get both is to use a device called a Searzall. It fits on a torch you hook up to a small propane tank. The device heats a metal grate to glowing, and this heat sears things without the stink of propane on your food. It’s a great tool, one I use all the time. But there’s another way, one that requires nothing more than a sauté pan and a spoon. My initial steps toward this perfection came in the form of this recipe for partridge with cranberries, which uses a technique I read about in the great cookbook Fäviken. It entails moving the birds around constantly, and then letting them rest a bit in between. It works. Really well, in fact. But it requires some two-handed action with tongs and some delicate balancing of the birds. Tough to cook more than two at a time this way. Then came my trip up north to Alberta, to hunt grouse with my friend (and Canadian doppelganger) Kevin Kossowan. We were camping in the Boreal Forest, so I cooked our grouse on a flat rock in front of a roaring alder fire. I’d never done this before. It was a revelation. I had to move the birds here and there on the rock to cook just right. We’d brought some homemade butter, so I basted the grouse often with this. Soon the grouse were sizzling in browned butter. Being able to move the birds to hotter or cooler places was a game changer. Primitive precision. And let me tell you, those grouse were some of the best I’ve ever cooked, or eaten. I lack a flat rock and an open fire in my kitchen. But I do have a sauté pan. 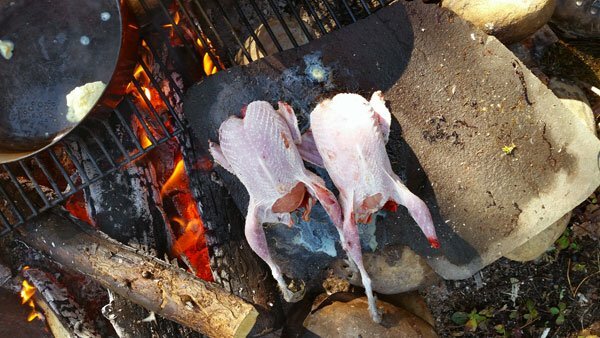 By combining the Fäviken and open fire techniques, I’ve found the best way to cook game birds. I am certain this method is not unique to me, but I came by it honestly. Here’s how it works. 1. Before you even cook your birds, your best bet is to set them uncovered in the fridge for up to 24 hours. The arid, cold environment of the refrigerator dries out the skin of the birds a bit, which will help crisp it later. The skin may start to look splotchy, but that’s normal. 2. When you want to cook your birds, set them out on a paper towel on a plate for a solid 45 minutes. Salt them inside and out now. It needs to be fine salt, not coarse, or the salt will create weird spots on the skin. It is very important that your birds start this process at room temperature. 3. Get a sauté pan large enough to hold your birds. Four at a shot are as many as I’ve been able to handle. Put a fair amount of fat or oil in it. Unless you are pathologically opposed to butter, use at least some. I like about 3 tablespoons of vegetable or olive oil along with 3 tablespoons of butter. Clarified butter is a good choice, but I like the browning of the solids in the butter; it adds something to the birds. Turn the heat to medium-high. 4. When the butter melts, set the birds breast side up in the pan. It’ll be a minute or so before they sizzle. Drop the heat to medium-low. You want a gentle sizzle here, lower than that of bacon sizzling. This helps prevent the butter from blackening and gives you the time you need to get to that perfect bird. 5. Once you’re at a nice sizzle, use a soup spoon to ladle the hot butter over the bird. Tilt the pan with one hand and spoon with the other. Do this constantly. 6. When the breast meat and legs have contracted a little and turned opaque, tilt the birds on their sides. You want the legs to get full contact with the pan. Ladle hot butter on the inside of the leg touching the pan, and then on the gap between the leg and wing on the side facing you. Ladle a little in the cavity, too. When the legs and wing on the bottom are golden brown, flip the birds and repeat on the other side. 7. Once both sides are browned, set the birds breast side up again. This is a good time to take a break, as you will leave them there, sizzling happily, for 3 to 5 minutes. 8. To finish, turn the heat up to medium-high again, and ladle butter over the breast until the skin browns; this is where the butter comes into its own — butter browns things faster than most other fats. Remove the birds from the heat and let them rest, uncovered, on a cutting board for a few minutes before serving. The result is nothing short of amazing. It is as close to that Platonic Ideal as I have ever been, and it takes no longer than roasting in an oven. If you can spoon hot butter on a little bird, you can do this. It’s that easy. 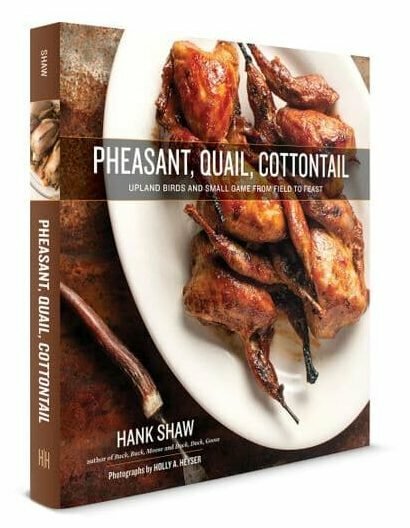 Explore the whole world of upland birds, from quail and woodcock to pheasants and turkeys, right here on Hunter Angler Gardener Cook! I’ve cooked a phaesant today believing this recipe would allow me to cook it while not drying the meat. It was not a disappointment, though not easy. The cooking took me a good half hour and I used a thermometer to measure the temperature of the breast. I stopped when it reached 70°C. The meat was very nice, well cooked and delicious. Maybe next time I’ll monitor the temperature a little more consistently as the breast was a little dry. I added sage and rosemary in the phaesant. I accompanied the bird with salad potatoes dressed with the cooking butter/oil.